Our Flag has been sculpted in raised relief and painted by hand, adorning the entire outer surface of this fine stoneware stein. 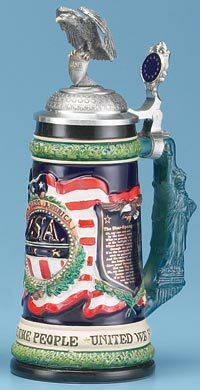 In the center of the stein is a raised USA hemisphere emblem with gold-leaf letters and stars against a royal blue background above red and white glazed stripes. GOD BLESS AMERICA is incised in a banner above the emblem. To the left and right are 2 raised cobalt blue shields, each guarded by a hand painted flying eagle. Mounted in gold leaf letters on the left shield is the Pledge of Allegiance to the Flag of the United States of America. The Star-Spangled Banner appears on the raised right shield. Deeply imbedded in a continuous, prominent band encircling the body are the proud proclamations of our nation--*WE THE PEOPLE* UNITED WE STAND*. Oak leaf borders frame the flag. The handle is an embossed and mirrored image of The Statue of Liberty. The ornamental pewter lid features rows of raised stars. A circle of gold stars appears in the inset, enameled thumb lift. On top of the pewter lid is an elegantly cast pewter eagle figurine. The magnificent eagle is perched above a shield with USA, stripes, and a single star. Gold highlights are applied to the eagle and shield. Limited edition of 2,000 pieces.